Shield Gantry Crane is specialized crane adapt to the engineering construction of subway tunnel and river crossing tunnel, mainly for TBM cutterhead, shield body installation of underground excavation equipment, as well as the transporting of tunnel support tube sheet during construction process. It is with stable performance, high efficiency, and easy maintenance. 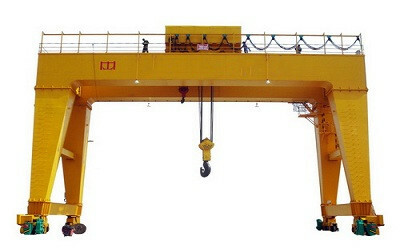 Upper spreader of shield gantry crane can swing to accommodate the needs of different directions digging, it is with flexible practices, perfect safety instructions and overload protection device, to protect the equipment and operator’s safety on maximize, electrical systems use of PLC frequency which has conducive to the control of all mechanisms. 1. 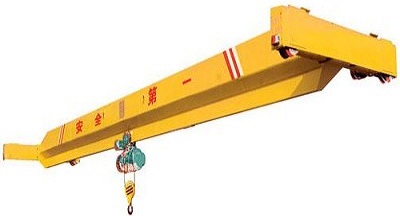 Shield gantry crane can be used in different diameters and different weight shield cutter and tube sheet installation, divided into four series: correspondence the lifting capacity 400 tons, 200 tons, 130tons, and 100 tons, use cutter diameter of 15 m, 13 m, and 6.3 m.
2. 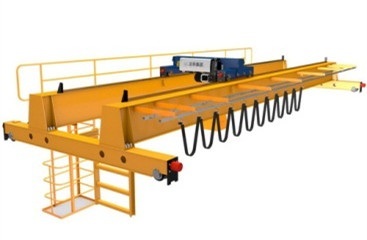 Shield gantry crane using ANSYS analysis software to analyze its structure and to optimize the design, so that it reduce the wheel diameter in the case of the structure to meet the operation requirements, reducing crane overall height, decrease wheel pressure, greatly reduce the cost of construction, while giving users bigger and more rational using space, to meet the user’s requirements on lifting the shield machine in a variety of conditions. 3. 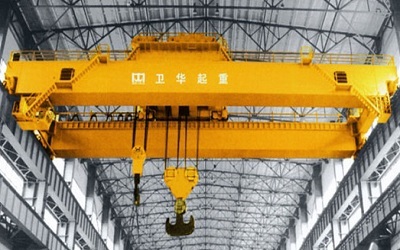 Shield gantry crane through frequency control, change of wire rope interactive wrapped and other methods to achieve the lifting speed adjustment, adapt to pipe parts and segment installation work under normal operating conditions. 4. Shield gantry crane adopts PLC control, which control efficiency, reaction speed and maintainability has improved significantly. 5. Shield gantry crane using new type rotatable multi-purpose crane spreader which is of our own proprietary to suit the needs of different digging directions. 6. 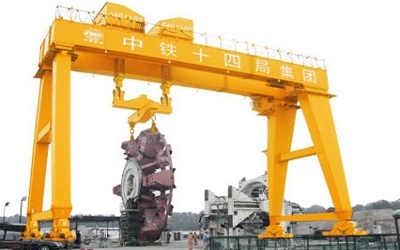 When the lifting weight is small of shield gantry crane, through changing the pulley rope interactive winding way, wrap the rope around the new pulley block, which change the lifting pulley block magnification, speed up the lifting speed.